Joachim Peiper ( 1915 - 1976 ) more often known as "Jochen Peiper" from the common German nickname for Joachim; born in Berlin on January 30 , 1915 , was a senior Waffen-SS officer and commander in the Panzer campaigns of 1939-1945. His father was a WW I veteran, and he had two brothers, Hans-Hasso and Horst. By the end of his military career, Peiper was the youngest regimental colonel in the Waffen-SS, officially known as: SS Standartenführer Joachim Peiper, 1st SS Panzer Division, Leibstandarte-SS Adolf Hitler. Peiper was recruited into the SS-Verfügungstruppe in 1935 upon his graduation from college. Sepp Dietrich reviewed his application and admitted him into the 1st SS "Leibstandarte Adolf Hitler " honour guard regiment, which was re-formed as a Waffen-SS combat unit at the outbreak of war. Initially he served as an Adjutant on Heinrich Himmler's staff before moving onto command various Panzer units within 1st SS "Leibstandarte Adolf Hitler". While on Himmler's staff, Peiper met and married his wife, Sigurd, with whom he had three children: Hinrich, Elke, and Silke. 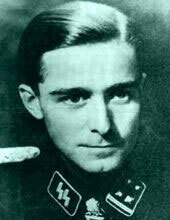 Himmler was particularly fond of Jochen Peiper and took a keen interest in Peiper's ascension towards command. At age 29 Peiper was a full colonel of the Waffen-SS, well respected and a holder of one of wartime Germany's highest decorations, the Knight's Cross with Swords personally awarded to him by Adolf Hitler. Peiper was a skilled combat leader and took part in a number of major Panzer battles of the war. His men were fiercely loyal to him, regarded by many as a "charismatic leader." Peiper participated in some of the most notable battles of the war to include the two battles for Kharkov and the Kursk offensive of 1943 on the Eastern Front of Russia. Most notably, he commanded the Kampfgruppe Peiper of the LSSAH (assigned to the 6th SS Panzer Armee under Sepp Dietrich ) during Operation Wacht am Rhein ( Battle of the Bulge ). Kampfgruppe Peiper advanced to the town of La Gleize , Belgium , before being turned back by American forces. Peiper was forced to abandon over a hundred vehicles in the town, including six Tiger II tanks, and made his way back to German lines with 800 men on foot. Peiper has been accused of, but never prosecuted for, the Boves Massacre. On another note, while in Italy, Peiper discovered that the Italian government had captured a group of Jews. Peiper had them released to him, and he then set them free. One of the Jews was a rabbi, who later wrote a testimony to Peiper's kindness during his war crimes trial. After the end of World War II , Peiper and other members of the Waffen-SS were tried for war crimes in the Malmédy Massacre Trial . Peiper volunteered to take all the blame if the court would set his men free: the court refused. Major Harold D. McCown, Battalion Commander of the 30th Infantry Division 119th Regiment of the US Army testified during the trials that he had conversed half the night with Peiper. McCown had heard of the allegations of Peiper's men shooting American POWs and asked Peiper if his men were safe. Peiper gave his word that McCown's men would not be shot; McCown also testified that he had no knowledge that any POWs were shot. Even so, Peiper was found guilty and sentenced to death by hanging , as were many of his men. Peiper later requested that his men be shot by firing squad and was denied. However, due to issues with the case against them, many confessions had been ludicrously coerced by the use of mock hangings and harsh beatings of the prisoners; the sentences of many of the Malmedy defendants were later commuted to life and then to time served, and Peiper was released on parole from prison at the end of December 1956, after serving 11 1/2 years, much in solitary confinement. After release Peiper eventually went to live in Traves , Haute-Saône , France , and supported himself as a translator. Following explicit death threats, Peiper was murdered in a fire attack on his house on July 13 , 1976 . The attackers were never prosecuted, but were suspected to be French Communists .